The Asheville-Hendersonville area of North Carolina is perfect for retirees looking for an active lifestyle. North Carolina has been a popular retirement destination for active adults for many years. With a moderate climate, miles of beaches, various recreation spots, and a handful of popular and unique cities, it’s no surprise retirees are looking a little more north. With so many distinct regions in the state, there are many different options for active adults. One of the regions that has seen a tremendous boom is the Asheville-Hendersonville area. Known for its mountainous setting, the Asheville metropolitan area has recently become known for its breadth of restaurants and breweries. The region enjoys a more temperate climate than most of the state due to its elevation and westerly location. Summers are warm but not sweltering while winters are cool but not freezing. 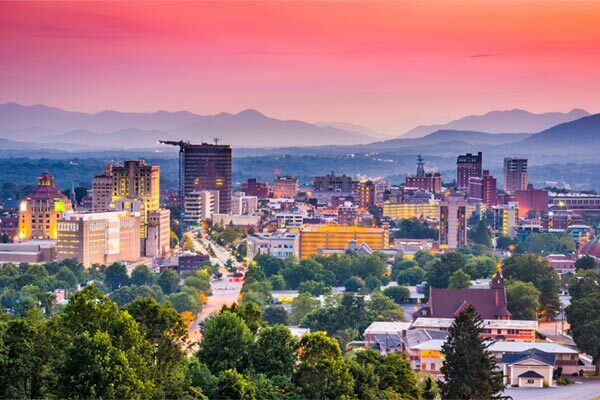 Asheville has long been known as an outdoor lover’s paradise with a mountain range, state and national forests, and iconic fall foliage viewing, Asheville’s most notable geographic feature is the Blue Ridge Mountains. The metropolitan area is nestled in the range, which makes popular activities like hiking and camping accessible. Favorite spots in the Blue Ridge Mountains include the Pisgah National Forest, Nantahala National Forest, and Cherokee National Forest. Come autumn, leaf-peepers from around the country come to the region to take in the mountain’s incredible fall foliage. Even those who don’t want to hike to enjoy the scenery will get beautiful views on the Blue Ridge Parkway. Other popular outdoor spots in the area are the Western North Carolina Nature Center and the North Carolina Arboretum. The Asheville-Hendersonville area is steeped in history and residents do not lack historic spots, museums, and cultural centers. Perhaps the most iconic is Biltmore Estate, which includes a French château-style house—Biltmore House—known as the largest, privately owned residence in the country. Visitors can tour the house, ornate gardens, and winery. Other popular attractions include Grovewood Village, the Thomas Wolfe House, and the Carl Sandburg Home. Asheville’s natural beauty and tree-lined streets blend perfectly with the city’s leisure spots, especially Historic Downtown Asheville. The city hosts an active music scene, popular restaurants, and one of fastest-growing craft beer scenes in the country. There are several concert venues in the area as well as annual festivals like the Lexington Avenue Arts and Fun Festival and the Mountain Dance and Folk Festival. Other popular live performances can be found at the Asheville Community Theatre, Asheville Lyric Opera, and The Fringe Festival. The region is home to an eclectic and emerging dining scene with varied cuisines such as traditional southern foods, tacos, vegan, and pan-Asian. Most restaurants are locally owned and specialize in farm-to-table dishes and embrace the area's warm weather with outdoor patios. Popular restaurants include Chestnut, Curate, 12 Bones Steakhouse, Tupelo Honey, and Biscuit Head. As the craft beer industry continues to grow, Asheville has become one of the most popular spots for beer aficionados. The city is known to have the most breweries per capita and has become a destination for people looking to take a “beercation.” Anyone can find a drink that fits their palette with breweries offering hoppy IPAs, traditional lagers, and dark stouts. Some of the highest-rated breweries include Hi-Wire Brewery, Highland Brewing Company, Bhramari Brewing Company, Funkatorium, and Burial Beer. There are 22 active adult and active lifestyle communities in the Asheville-Hendersonville area, each providing a unique set of homes and amenities. The biggest community in the area is Connestee Falls in Brevard, which includes 1,300 attached and single-family homes. The community uses its picturesque setting perfectly with an 18-hole golf course, a boating lake, miles of walking trails, a community garden, and various sports courts. Active adults looking for new construction will find them at Maple Trace in Weaverville. This community includes 140 low-maintenance homes priced from the low-$200s to the mid-$400s. Riverwind in Etowah is one of the areas most popular 55-plus communities with 190 single-family homes priced in the mid to high-$100s. It includes two clubhouses, a game room, an outdoor pool, and horseshoe pits. When looking for a mountainside retirement destination, the Asheville and Hendersonville area offers beautiful views, a wide range of outdoor recreations, diverse shops, and delicious local eateries. Take a visit and you may find your ideal retirement location.